Piedmont is renowned all along the Italian peninsula for its variety of antipasti. They abound here in many forms – raw or cooked, hot or cold – and can be meat, fish, egg, vegetable or cheese-based. In addition, it’s not uncommon for at least three antipasti to be served at meals. Given that there’s still an abundance of food to come – starters, main courses, desserts– many diners take it easy, limiting themselves to assaggini (literally, ‘little tastes’) when antipasti are served. In my case though, any vows to show restraint simply go out the window when a quality vitello tonnato is served to start a meal. The meat-fish combination integral to this cold antipasto dish is just too difficult to resist! 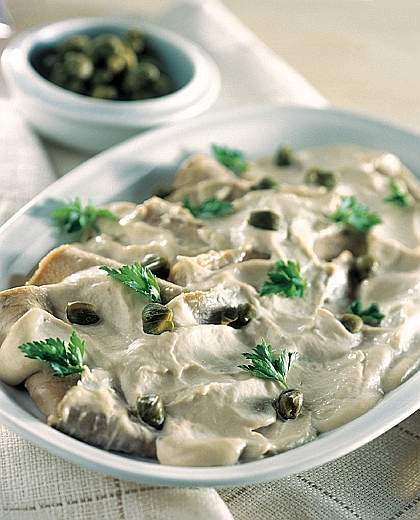 Vitello tonnato is essentially a boneless cut of boiled veal served with a tuna, egg, anchovy and caper-based sauce. Although Piedmont is landlocked, trade with the neighbouring coastal region of Liguria has given the Piedmontese access to olive oil, capers, citrus and preserved fish throughout the ages. For this reason, anchovies figure in many other typical regional dishes,such as peperoni con acciughe and bagna cauda. Vitello tonnato began to appear in Italian cookbooks during the 19th century. However, it was Pellegrino Artusi’s 1891 bestseller, Science in the Kitchen and the Art of Eating Well, which really put this sublime dish on the culinary map. Artusi’s ‘scientifically tested’ recipe called for boiling a kilo of veal with vegetables and herbs for an hour and a half, leaving it to infuse for a day or two and cutting it into fine slices covered in a sauce made of tuna, anchovies, capers, olive oil and lemon juice. In other recipes, boiled egg yolks featured in the sauce recipe too. These days you’ll find that the boiled eggs are increasingly being replaced by mayonnaise. Some chefs do not hold the contemporary addition of mayonnaise in high esteem. In my opinion though, mayonnaise works really well, provided it is a homemade one! Paolo, my local butcher, loves sharing recipes and cooking tips with his customers. Last week, when I ordered some veal to make this dish, was no exception. He even offered to cut the veal with his slicer after I prepared it! The following recipe is therefore based on his recommendations. Fill a large pot with water (there should be enough to cover the veal) and add celery stick, carrot, onion and herbs. Bring to boil and carefully place veal in pot. Add salt and pepper. Allow veal to cook covered with lid on low to medium heat for about an hour. Allow veal to rest in its broth until it has cooled down completely. Put veal in refrigerator (it should still be covered in its broth) for at least 12 hours. Put anchovy fillets, tuna, capers, hard-boiled egg yolks and a couple of drops of extra virgin olive oil and leftover veal broth in a bowl and process until obtaining a smooth consistency. Remove veal from broth[i] and cut veal into fine slices. Arrange veal slices on a large oval-shaped platter and spread some tuna sauce on top of slices. Decorate platter with a few caper berries and lemon wedges and serve at room temperature. Buon appetito! [i] You may wish to keep your broth and make a lovely risotto with it as Artusi suggested at the end of this recipe!